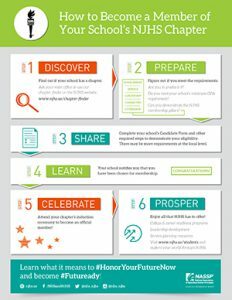 » Here is a visual guide prepared by the National Junior Honor Society about how a student can become an NJHS member. As your school begins the process to apply to become an affiliate of the National Junior Honor Society, there are a few things to consider and prepare before beginning the official application. Review the National Junior Honor Society Constitution and make sure your school is willing to comply with it. Appoint a five-member faculty council. The council meets at least once a year to select new NJHS members and review and revise chapter procedures. You can also download a new chapter application here. (Virtual schools, please also download this questionnaire if you are not submitting the application online.) The annual fee is $385. Discipline and dismissal procedures. Begin with policies found in the NJHS Handbook and National Constitution. You can also follow NJHS on Facebook, Twitter, and Instagram.